British blues-rock prodigy John Fairhurst is gearing up to greet the new year head-on as he blasts out of 2018 with a date in Brighton. On the eve of the tour, Fairhurst has shared a new live video of his set-staple Hungry Blues. Recorded at Tottenham's That Sound Studio, the nine-minute free-wheeling video offers an example of the firepower the world class bluesman will be bringing to his Winter UK shows. Channelling a kaleidoscope of sounds, Fairhurst is a master of shifting between his customary acoustic solo Delta Blues show, to a powerful raw rock duo. With Toby Murray on drums, the pair hit the road this month for a full UK tour to preview material from what will be Fairhurst's first studio album in five years (currently expected 2019). Through an expansive and patient stomp, Fairhurst and Murray circle around each other with menacing intent, plotting gory revenge over six minutes, drawing equally on the fire and grit of Black Sabbath and Tom Waits. Fairhurst's music takes the audience on a musical voyage of spell-binding improvisations drawing freely from a rich tapestry of influences that span from the Mississippi to the Ganges and all that is worthy in between. As a duo, Fairhurst and Murray draw freely from rock, blues and world music, with a penchant for slide guitar and through his distinctive deep growling voice, the songs, delivered in pure raconteur style, narrate the hardships of a life on the road and the bleakness of our times. Following 2014's highly acclaimed Saltwater, Fairhurst is currently preparing his first album in over half a decade. The album, scheduled for release in the Spring of 2019, promises a real melting pot of diverse musical influences and styles drawn from all of his experience. 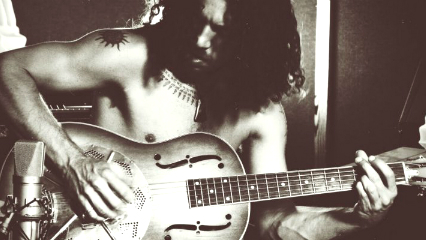 John Fairhurst plays The Brunswick, in Hove, on Thursday 29th November 2019. CLICK HERE for tickets.